Ice in Sangria? De Rigueur and the only time I will do it. 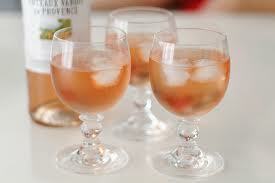 White Wine Spritzer? Never OK for so many reasons. Wine on the rocks? Hell no!! We have a friend, a certain Ms. L, who drinks primarily (OK exclusively) whites. She insists on the ice thing. Reason? She likes the clinking in her glass. Reminds her of a party, I guess. Recently, she joined us with some other friends for a visit to one of the cathedrals of Italian wine and food excellence, Eataly in NYC. After ordering a nice bottle of white, she proceeds to dump several ice cubes into her glass. One of my other friends, Mr. M (a native of Piemonte) was about to have a seizure upon witnessing this. I quickly shot him a look and whispered, “I know; just look away.” But Ms. L, it seems is not alone. Is this behavior limited to people who are not wine professionals/critics/lovers? Apparently not. During a trip to Sonoma a few days ago, I saw a Dry Creek Valley winemaker do the same thing! His explanation? Gives him an opportunity to drink more without getting hammered. Here’s an idea: DRINK MORE WATER. Personally, I like Ms. L’s explanation better. Speaking of snobbery, is this any different from pouring a lesser wine when the people drinking it are not truly appreciative of, or willing to make an effort to appreciate, what’s in the glass? Do you pour Petrus for the masses? Hell, bad example, I don’t pour Petrus for myself. But you get the idea. People will tell you that they are not wine drinkers, until they find out that you’re pouring from a special bottle. Then it turns out the unruly hoard is lining up for their allocation… usually a nice tall glass of the stuff. “Fill it to the brim please.” They are so polite. They are also the first to say the wine is too dry and that they wished it was, you know, sweeter. Ugh! Did I mention that the winemaker who put ice in his wine is of ITALIAN descent. He must have learned this from his elders, who in turn must have learned it from their ancestors in the “Old Country”! Syb, The problem is not you, but rather Ms. L – she is hanging around with wine snobs. She sounds like a blast and is welcome anytime at one of my gatherings – with ice! Hell, I’ll even make her a spritzer and have one mself! This world needs more fruitcakes and less bakers! You know, Jimmy, this reminds me of the most Interesting Man in the World commercial: If I said to you, “It’s not you, it’s me.” I would be lying. Don’t be a hater, Dude. Some people claim that there’s a woman to blame, but you know, it’s your own damn fault.